BUENROSTRO, Iyra S. (2018) ‘Unframing’ Photographic Histories: Stories and Context Beyond the Visuals. Paper presented at: IFLA WLIC 2018 – Kuala Lumpur, Malaysia – Transform Libraries, Transform Societies in Session 153 - Poster Session. 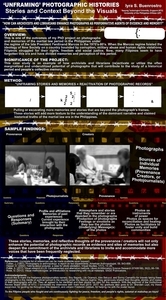 This is one of the outcomes of my ongoing PhD project on photographs and memories of Martial Law period in the Philippines under the regime of the late President Ferdinand Marcos in the 1970’s-80’s. With the Marcos regime’s imaginary of foisting the ideology of New Society on a country hounded by corruption, military abuse and human rights violations, Filipinos struggled for their rights, freedom and social justice. Decades after the reinstatement of democracy in the Philippines, many Filipinos seem to have forgotten this era and have divided memories and perception of this period. In this project, I aim to contextualize the photographs taken during the Martial Law period and the historic EDSA People’s Power Revolution that ended the dictatorial rule. Photographs, being forms of documentation and evidence for informational and historical inquiries, are ‘unframed’ by searching for the provenance and stories as recounted by their creators – the photojournalists. The photojournalists unfold the purpose, social atmosphere, as well as the various meanings and context that surround their photographs. 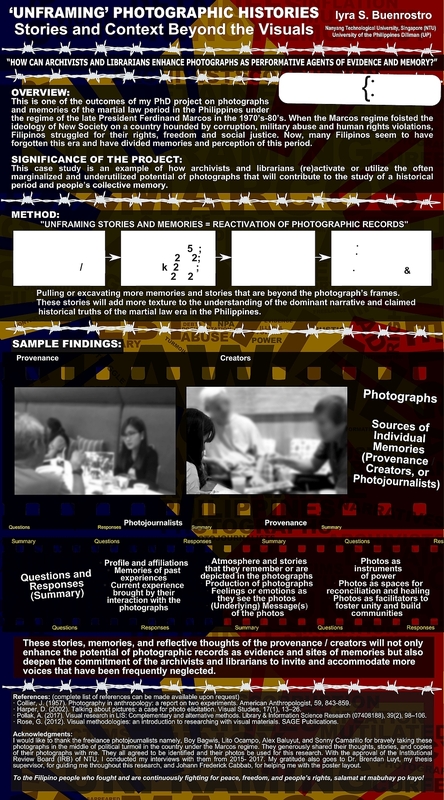 Through this method which involves photo elicitation, I demonstrate that librarians and archivists can go beyond the traditional collection and description, and open a space for more narratives to help reconstruct social memory.